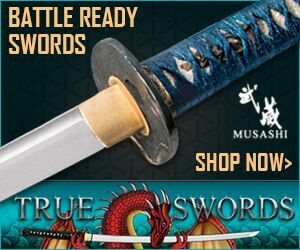 The Windlass 1860 Cavalry Saber is easily one of the most affordable swords of its type available online, with a typical price tag that hovers around the $100 mark depending on where you buy it. 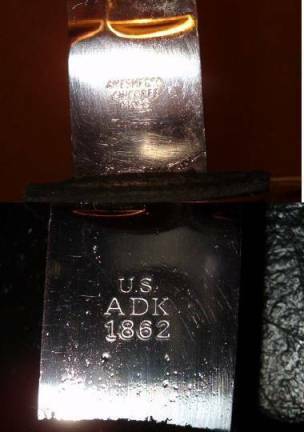 The blade on the 1860 Cavalry Saber is historically inaccurate in thickness, as most period originals would have been 5/16-3/8" thick at the guard, tapering to 1/16" at the tip. Still, the blade is just about ideally tempered, so as to strike a near perfect balance between flexibility for cutting and rigidity for the thrust. 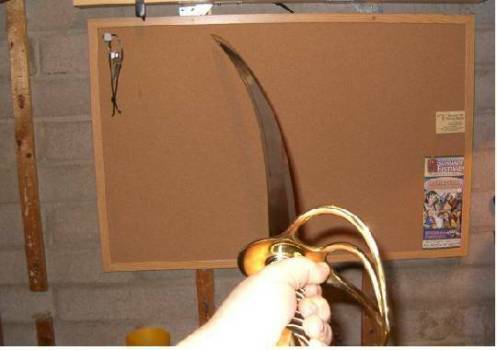 I have to give Windlass credit for this, as some of their blades are far too flexible. The blade has the typical 1860 Cavalry Saber "dual fuller" (my terminology), in which there is a wide, shallow fuller on either side of the blade running about 3/4 of the way down and a smaller fuller within each of these near the top edge that runs about 2/3 length. Fullers are nicely done and even. As with other WS products, the blade came blunt, but just barely. 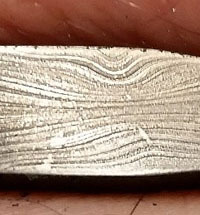 The "edge" has about a 1/64" flat face on it, so it doesn't take much to sharpen. I used a combination of a butcher's steel and my graduated coarseness Edgemaker system to sharpen the edge from roughly the halfway point to the tip, leaving the half closer to the hilt blunt for parrying (as was fairly customary on military sabers). This imparted a secondary bevel to the sharpened portion of the edge about 1/16" wide with a 45 degree included angle. The blade has a fairly standard Windlass polish to it, or just shy of a mirror finish, but (thank goodness) it doesn't come with that annoying Windlass clear lacquer coating. It also features correct markings (no "Made in India" or "India" markings anywhere) with AMESMFcO CHICOREE MASS on the left face of the ricasso and U.S. ADK 1862 on the right. The hilt on the 1860 Cavalry Saber is made up of several parts. First, the heavy brass three-bar handguard, which is beautifully cast with only one very minor pit on the face. 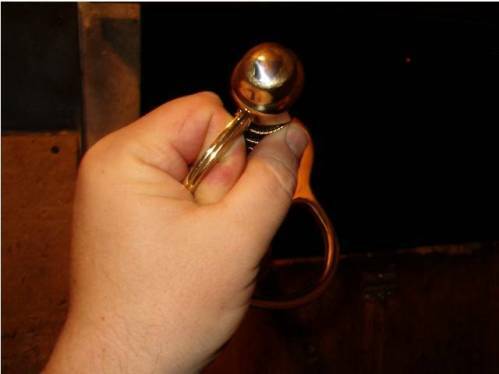 Second, the brass buttcap through which the tang is peened. Again, this is very well done and looks nice. I have no idea what the grip core is made of (and I don't intend to strip it down to find out), but it feels very hard and solid. The grip is a sandwich type affair: over the core is a wrap of (I'm assuming brass, since I can't see it) double-strand wire in a spiral pattern running the length of the core. Next, there is a piece of nice looking black leather wrapped over that. Finally, there is a second bit of double-strand brass wire wrapped over that. You can see the ridges of the wire under the leather and the wire over the leather is wrapped so it fits between these ridges. The wire wrap is pretty straight and extremely tight and immovable. In fact, that is an apt description for the hilt as a whole. The entire thing is tight as a drum with absolutely zero movement, pinging, or any other unpleasant traits. Again, kudos to Windlass. 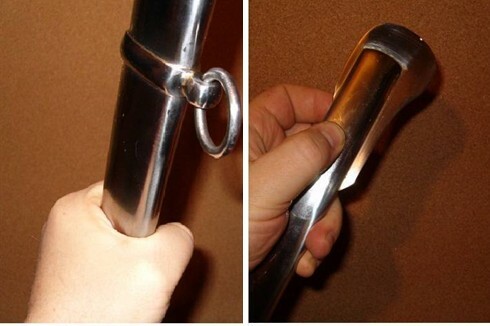 The scabbard is a reasonable facsimile of a period original made of heavy gauge steel with two 7/8" diameter by 1/8" thick steel suspension rings placed at 3" from the throat and 7-3/4" below that, and a removable throat cap, which contains the wipes that help keep the sword in place through friction. I can't tell exactly what the wipes are made of, as I haven't disassembled this part, but they appear to be black rubber or plastic. The sword fits in very snugly, once fully seated and will not fall out under any circumstances. In fact, it fits a little too snugly for my taste, so I may look into modifying it at some point. In all, the scabbard feels extremely solid and would make a heck of an impact weapon on its own. All the various parts of the scabbard (rings, ring mounts, drag) are very well brazed and evenly applied. 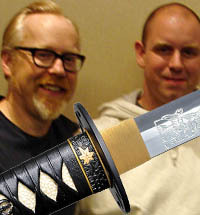 Once I got the blade sharpened, I took the sword out and tried it out on water-filled 2 liter Coke bottles and 1 gal. milk jugs. Needless to say, with its curved edge and forward balance point, it made short work of these pitiful "victims". It almost wasn't worth it, it was so easy. Pickle chipping is the order of the day with this baby. I also caught Windlass in an apparent moment of modesty. They claim that it will flex to 20 degrees and return to true. Meh, that's nothing! I bent this blade to about 30-35 degrees out of line in both directions and it returned to true. Wow! How often does a manufacturer understate the abilities of its product? 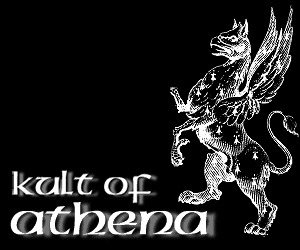 ments from an original, and, thus, fails to capture the true brutal power imparted by such, it is still a very cool and solid little saber in its own right. It features a nicely-tempered blade, rock-solid hilt, and solid scabbard. 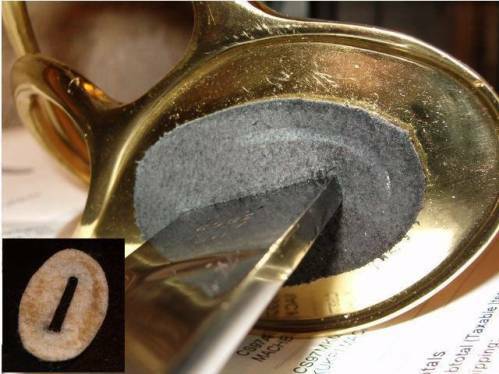 And, with its center of gravity and center of percussion, it's a natural cutter. Unless this sword suddenly explodes one day in my hand I can very hardily recommend it to anyone looking for a fun, solid, well-made 1860 Cavalry saber that should provide hours of backyard cutting mayhem and fun. After owning the 1860 Cavalry Saber for a while and having the chance to do a decent amount of cutting with it, I remain impressed. 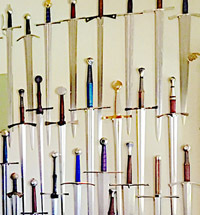 The hilt components have remained nice and snug, with no movement of the wire wrap, guard, or hilt as a whole. 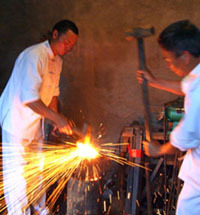 The blade has not taken a set or sustained any other sort of damage, other than the expected cosmetic scratches from cutting. 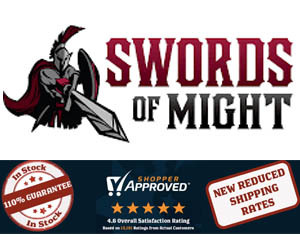 From my perspective, this is definitely the best deal currently going in the affordable sword market. Historical accuracy was a tough one for me. 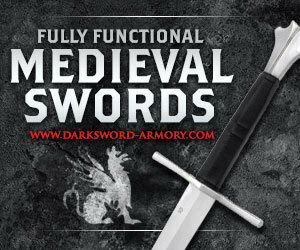 The sword mimics historical examples in virtually every aspect except blade thickness. I was tempted to give it a 4/5 in this category; however, with a blade that's only roughly half (or a bit more) the thickness of originals I've seen, I decided to go 3/5. Fit and finish of the 1860 Cavalry Saber are wonderful, with the only downside being the overly shiny blade. I think this could be improved with a bit of fine Scotch-Brite, though. Handling is quite good. Though thrusting isn't necessarily the curved blade's strong suit, the tip is fairly easy to control, and the weight forward balance and curved edge give great slicing/chopping performance. Structurally, the sword has held up fantastically. I was somewhat tempted to go 4/5, because the rather thin blade looks a little flimsy when viewed from above and the whole sword has a 'smallish' feel to it overall; however, I'm going with actual experience, rather than perception and going 5/5 on this one. It doesn't "feel" like a "tank" (referring to durability rather than handling), but it has held up too well to give it any less. Value for money? Read my update comments above: 5/5! Blade is on the thin side (but still very durable due to the steel and tempering). 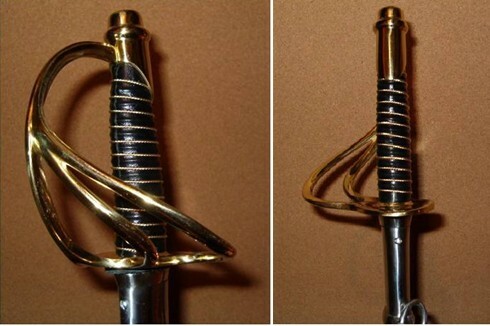 The 1860 Cavalry Saber is typically available online for around $100 USD. 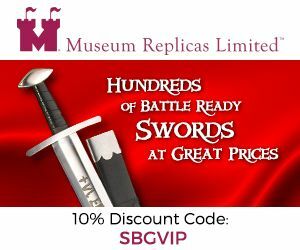 However, the best deal I can recommend for it is here at Museum Replicas where it is available for $109 (plus they also have a sharpening option if you cannot be bothered doing it yourself). And don't forget to the use the MRL 10% discount code SBGVIP - use this coupon and the price drops down to just under $99! 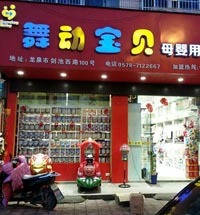 (click on the link above for more info on SBG coupon codes). I hope this review of the Windlass 1860 Cavalry Saber has been helpful. 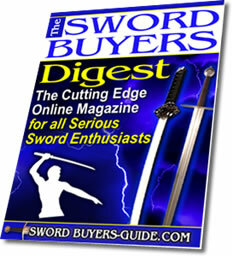 To return to Slicers, Scimitars and Choppers from Windlass 1860 Cavalry Saber Review, click here.